Cherokee is a privately-held, owner-operated real estate and financial services organization based in Red Bank, New Jersey. We service our own portfolio of mortgages, notes, and other lien assets. We are principal investors. Cherokee does not service loans for third parties. We are not a collection agency. We do not have "investors", nor do we accept funds from third parties for investment activities. Cherokee holds lien assets in sixteen (16) states as of December 2007. We have local representation in every state, and in every jurisdiction of the U.S. Bankruptcy Court. Cherokee does not originate loans. We buy existing (non-performing) debt from others. We primarily buy non-performing Notes, Security Instruments, Deeds of Trust, and Mortgages, and other distressed and subprime liens. If you or your organization own or manage non-performing assets that you wish to offer to Cherokee, please click here. If you are an attorney, a real estate broker, or a title abstractor interested in working with us as a business partner, please click here. If you were notified that your loan was transferred to Cherokee, please click here. Cherokee contributes a portion of our profits to affordable housing renovation and other "quality of life" activities in New Jersey, concentrating our efforts on affordable housing, and protecting women and children from domestic violence. For more information about the ways that Cherokee gives back, please see our Giving Back web page. Cherokee is a stable, reputable, owner-operated private company. 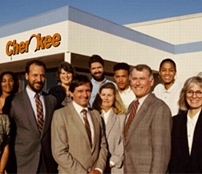 The first Cherokee business entity was founded in 1990 in East Brunswick, New Jersey. We recently relocated to larger offices in Red Bank, the financial capital of Central New Jersey. We’ve had essentially the same ownership and management throughout our history. We have been involved with state and county social service and housing programs for almost 15 years. Cherokee is committed to working with our clients in an ethical, responsible and understanding manner. Hard times can affect anyone, and we're prepared to exhibit great flexibility and forbearance in restructuring the obligations of borrowers who exhibit good faith. We are committed to the principles and spirit of the Fair Debt Collection Practices Act and the Fair Credit Reporting Act. If you would like to communicate with us, please see our Contact Us Page.